Our next stop on our excursion to the gardens of the Prague Petřín will concern one of the most beautiful and visited gardens of Petřín Hill. 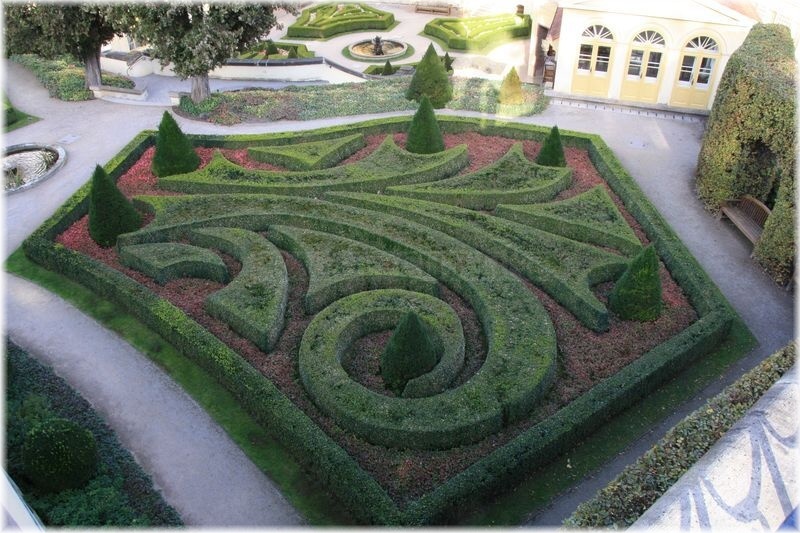 Vrtbovská Garden is one of the four Baroque gardens completing the beauty of Petřín. 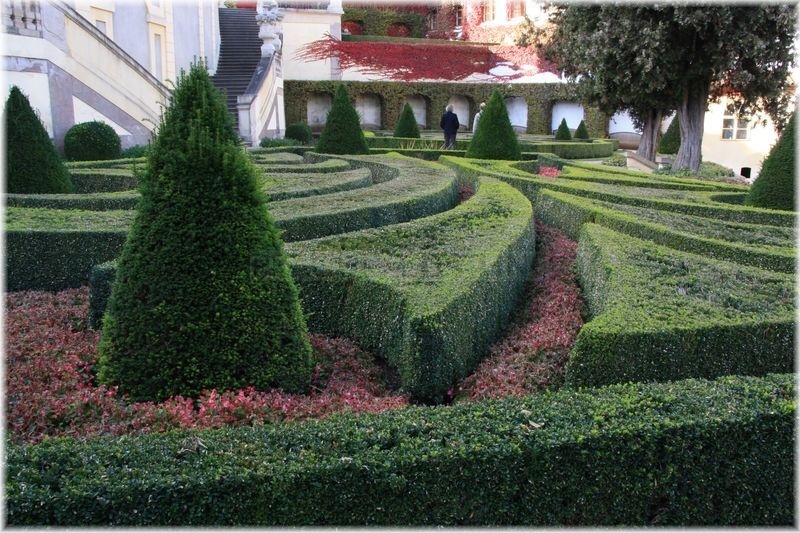 Let´s visit the garden which is said to be the most beautiful garden of its kind in the north direction from the Alps. We will get inside through the entrance from Karmelitská street in the Lesser Town. 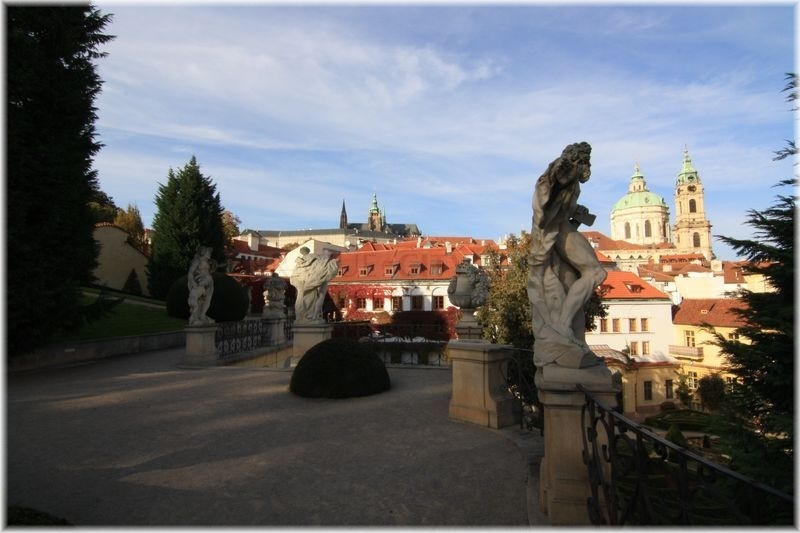 It is a panorama of the extensive complex of one of the most beautiful Petřín gardens. 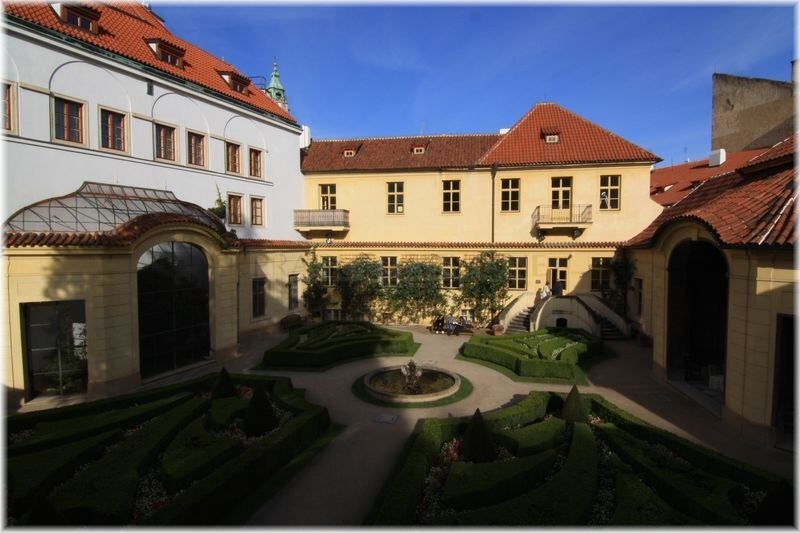 The appearance of the garden is work of František Maxmilián Kaňka, the employee of the Count Jan Josef Vrtba between 1715 – 1720. Count Vrtba used to be the grand burgrave of the Prague Castle. Kaňka not only reconstructed the Count´s palace but also created the unique Baroque garden which was surroundding it. 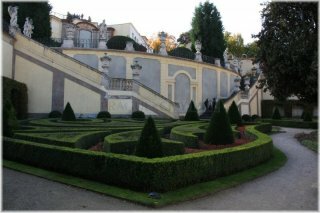 With help of the perfect sculptural art of Matyáš Bernard Braun and due to the frescos of Václav Vavřinec Reiner a gorgeous areal was made which is still being considered one of the most attractive gardens of its kind. In the garden which is situated 212 meters above sea level and covers 0.31 hectars you can view not just beautiful antique statues and fresco decorations but also unique bushes and trees that create the spectacular image of the garden. Vrtbovská garden is composed of three-level terraces, each offering exceptional view. 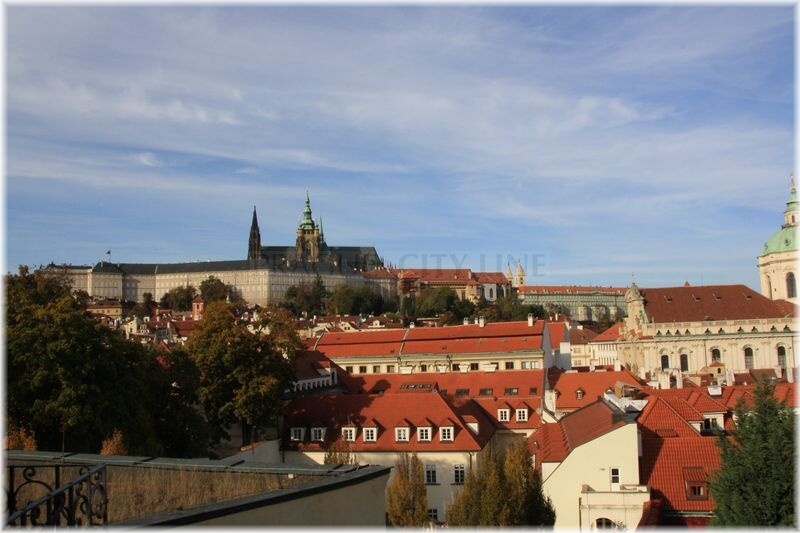 The terraces are interconnected by wide staircases which provide bird´s eye view of the Prague Castle, St. Nicholas Church or the more remote Týn Church. While walking around do not miss the unique decoration of sala terrena (garden hall) displaying Venus and Adonis from Václav Vavřinec Reiner. Sala terrena creates a sort of a link between the adjacent palace and the garden. There are more sights worth seeing – e.g. the pool in the lower part of the garden with a statue of “putti“(baby) on a sea monster. Several reconstructions were necessary in order to keep the unique appearance until now. The most extensive one lasted from 1990 until 1998. During the reconstruction works the garden regained its original appearance. Currently it is a popular place for various social events such as conferences, seminaries and weddings. 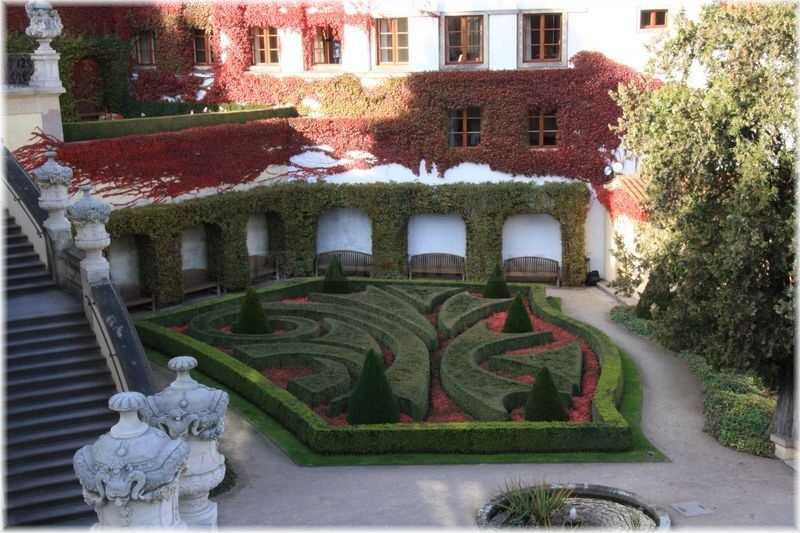 Vrtbovská garden is opened daily from April-October, 10 am – 6 pm. Accredited guides can enter the garden premises free of charge. The tour guide of a group of more than 10 people will receive a 20 % discount for the next seightseeing, the discount vouchers are valid 1 month after its issuance, afterwards the tickets expire. The guide can use the discount vouchers again only for collective seightseeing tours with more than 10 persons. From Malostranské náměstí walk down Karmelitská street, the entrance to Vrtbovská garden (house number 25) is situated at the first crossroads of Karmelitská street and Tržiště.